We are in for another intense week as there are several factors in place. November 28that 6:45 AM Pacific the Moon will be in its fullness in the sign of Gemini with the sun sign of Sagittarius. We will be experiencing a Lunar Eclipse at this time in which we are coming to a cross-roads between the Higher Mind and Lower Mind. It will be a very powerful time for each of us to fully decide which road we are taking as whatever we decide will determine our next experiences of the activations in December. We are being assisted by taking a look at the old relationships and parts of ourselves that do not fit into the higher realm of integration. 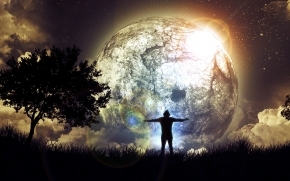 This full moon is totally going to assist each person on the planet to tune into what does not befit their new reality if they are ready to hold the frequency within the Illumination that They Are. The best part of the frequencies this week is that Mercury has now gone direct which will ease up the communication issues you might have encountered with others or with technology. Meleriessee shared last week about how she felt that receiving lower physical vibrations have truly assisted her in going through a deeper healing process. This is continuing and the levels become deeper and deeper. If you have awakened and stepped onto a pathway of pure illumination within your Being, then you are going to be challenged with elements that do not fit your higher vibration. This full moon is going to assist us with this process by moving us along and finding the balance between the lower and higher minds. We don’t have time to waste and we must take each opportunity to move into the depths of our Higher Self’s and I AM Presence. Sometimes we don’t know what that process is going to be but that is the beauty of it all. Not knowing is truly in Mastership as there is no past nor future to deal with; it is being in the NOW. So take this opportunity to fully get deep within yourself; talk to your Higher Self and I AM Presence. You can do so by intending to be fully with them. They are for this opportunity to move into a higher frequency within your physical body but you must do the work in order for it to Be. We are in the process of removing old timelines and finding the ones that we thought we lost. There cannot be any fear in that occurring as it is a beautiful moment to fully find yourself activated within the body you have chosen at this time of your life. This process can get easier if you fully accept these changes now; otherwise, it will become very challenging and sometimes as if you cannot surmount the mountain in front of you. Realizing your true potential will allow you to have the Freedom and Grace of God that you are. Join us on Wednesday evening November 28th at 5 PM Pacific as we host a Full Moon Ceremony to help individuals walk through this process with Ease and Grace. Details are available on Walking Terra Christa.com/Tele-calls. This is the week of acceleration you have been waiting for. We fully anticipate that this week will be one that is entirely focused on your personal pathway to help you change the areas that you have been searching for and remove the dogma and debris that you have been holding onto. You see, it is not your fault that it has been this way. It has been the way of the world in human form and as we see it presently, it is now going to be washed as you choose it to be. The point being is – are you ready to choose it to be gone from your consciousness, from your experiences, and from your life circumstances? The dark night of the soul is going to immerse within each of you one more time during this Full Moon and Lunar Eclipse of November 28th, 2012. You have been pulling away pieces of it for a very long time but in truth, not enough. You are still feeling remnants of your past timelines that are creeping in for you to look at. This is all a good thing. You are at a very opportune time of creation upon this planet to fully step into your full power; this power needs to be unleashed but not with the old elements that have been stuck in your Etheric Body to resurface at a later time. This is what happened to Atlantis and Lemuria. Old elements arose at the most inopportune time of creation to threaten the very existence of life on earth so we had to go back to its pure beginnings once again. You have now arrived at the point of your arrival when you have the ability to fully allow the old elements from your timelines to be completely removed so that you may be fully activated into the best and the brightest that you can be. You have already been working through these processes throughout your life and especially in 2012. This Full Moon in November will be your last chance to fully allow the parts of yourself that do not serve you to be removed, as you are regenerated into the Being of Light that you are. Please know during this process that you will also think you are removing elements you need. That is the lower mind and the lower ego talking. You think you may need these parts of yourself, but in truth, your Higher Self knows exactly what you need. They are ready to tell you but you must be very active in your role with your Higher Self. Allow yourself to fully feel the accessibility of Light to come into your Being and be that Light infused man or woman that you are. Your contracts are now open and fully activated to purse your dreams and vision but you must act accordingly and without hesitation. The energies of the 11:11 and 11:22 in November have prepared you for this time of creation. Each of you has a depth within your Being to fully access new and developed abilities within your consciousness. It does not matter where you are on your pathway of Awakening or level of Mastery, this next occurrence of this week is going to take you into a deeper level of yourself. All you have to do is be open and receiving for it to occur. You know the drill ~ the full moon is about releasing the old; but in this aspect it is all parts of the old; not just a portion of who you are in this moment, in this lifetime, but your Soul’s Essence. You will be experiencing a deeper part of yourself than you ever realized you had and once you do, then the awakening will be easier for you to handle in the physical world. The activations occurring in December are going to be huge for each soul to incorporate so it is up to you, as the physical creation, that you are to fully embody this essence within the confines of your Heart and Soul by allowing the essences that are coming to you to BE YOU. We can make a few suggestions. Number one would be SURRENDER. Yes, allow your physical body to surrender to the process and let the healing begin. Many of you are already doing this. The challenges within the physical body currently are due to the influctuations of the crystalline structure entering the physical frequency. This can result in physical conditions that may seem they are of the past which there are some fragments still being held within your system. The other aspects of this are that whatever your intentions have been previously, they are held within your belief system. You will relive them along with feeling new conditions appearing in your fields. The crystalline body cannot hold onto any dis-ease anywhere within the system so the resultant factor can be dis-ease manifested as a viral condition. The other element that comes into play is being in public places where the energies are lower than what you are intending them to be. So if you are living in a sacred space, with the higher frequencies with the use of crystals, light formations, and protective measures and walk into a restaurant or place of business is lower than what you are used to then elements can seep into the parts of your field that are moving into the higher crystalline structures. These are all compounded into what you are experiencing presently. Number 2, you must be very cognizant to the Mental and Emotional bodies. It is important not to let any issues that arise to move into the physical structure as it will be activated in a very physical way. The power of your energies presently is not to be denied. Your thoughts and emotions must take precedence to everything you are experiencing and this will be the RULE of your days ahead. Number 3, enjoy the resultant energies. You will get through the process by asking for our help in your sleep-state, and know that you are not alone. This is a new step for all of us. The wave of consciousness presently is changing at a percentage that has never before occurred on this planet or any planet. So take time for yourself this week to allow these elements to be removed and let the body heal in the way that it should; not on your time frame in the physical world, but on the time of the multi-dimensional self. Thank you for allowing yourself to grow deeper through this process and walk as Leaders into the New Earth. Your work is deeply needed for many. We are the Unified Whole Command walking with you hand ‘n hand for Oneness. ©2012 Walking Terra Christa ~ All Rights Reserved. This information may be shared with the link to this page, http://walkingterrachrista.com. Due to the lateness of this update this week, we are changing our venue for the Frequency Update. 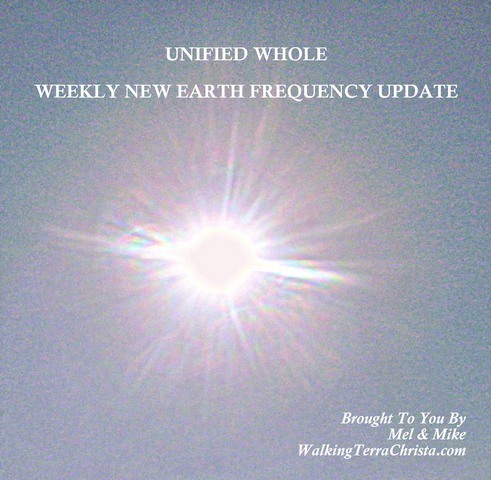 We apologize for not providing it in a timely manner but due to energies shifting, bodies healing, and allowing the new frequency to be fully in place, Meleriessee has been unable to put out the information. On this update we will talk about the 11thGateway and what it means for each of us along with a special message from the Unified Whole Command on the subject. On November 22nd, 2012 we are entering into another portal of Light to take us into deeper levels of ourselves. This month has more activations that are readying each of us to go into the depths of our soul to be more fully ready within the physical realm to hold onto the Light Frequencies that are going to occur within the planet. It will depend upon your physical creation within your spiritual essence in what occurs for you individually, but in truth, what this means is that the deeper your awareness the more in-depth frequency you will receive. So what happens when your body is hit with lower vibrational energies? You experience it through your four-body system until it can become One Body of light. And usually, you need to experience it in all four bodies. The order that this happens depends upon which ones are the strongest and the weakest. The stronger body of the Physical, Etheric, Emotional and Mental levels will deal with it first. It usually happens in this way. Then the one on the end of the chain will be hit the hardest. If you have been doing this work for many years, then you probably have strengthened all of these bodies which mean that it is now time to fully accept the physical body as One Body of Light. Through these activations of this month many individuals will be challenged very physically within their structures. It is a time when the timelines are coming together to create the total existence of your reality and the physical essence will house all the other bodies, it needs to shift and change into that new reality, and fully accept the Light Body as One Body of Light. All of the bodies are coming into One Unified Field of Reality to fully accept the next wave of frequency which happens to be the last wave of the 11:11 cycles. This Gateway of 11;11 occurring on November 22nd is going to be a massive change within each person upon the planet. So whatever you are experiencing presently, step into it further. Utilize the higher vibrations to assist the bodily functions and know that when you are feeling physically ill, not to use the word “sick”. It will make you feel worse. We are being challenged presently through the physical essence and when that happens all your timelines are coming together to be fully released. So, we are being challenged to be better, to be more whole, to accept our highest divinity within us. The body is going to ache, it is going to hurt in places you thought you had healed, but it all must be released. We know, because this happened to Meleriessee in the past week as she walked into a public place that had some lower viral energies and her body was challenged. What she realized through the process that this attack actually was a gift because the parts that were weak physically are now becoming stronger with the work she is doing on the higher vibrational levels. She has not had to feel this type of energy for several years as she thought she had moved beyond getting “sick”. If you are not being challenged physically, then your structure is very strong and you probably are releasing through your emotional and/or mental levels. Utilize the same philosophy of the Rays of God, spectrums of light, and higher vibrational energies to assist the removal of the old elements. This is our preparatory stage of development as we are about to walk through another entryway of Light that is beyond anything that we can imagine. The more we can do through this process within ourselves, the more we can hold it on December 21st. This doorway represents our mastery in its highest frequency so what does not fit your pathway of Mastery needs to be removed no matter how deep the challenge must be. Step into your New Reality; be True to Yourself so the doorway can now be opened for others to see your True Reflection. 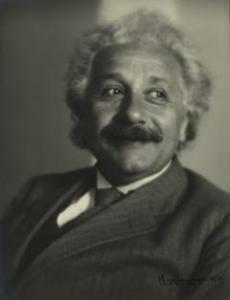 We come to you in the consciousness of the Great Divine Director, Master Toth, and Albert Einstein. We thank you for listening at this time to your own hearts and Divine Creation that is accelerating within your Being of Light. We know that some of the challenges each of you are facing seem insurmountable but in truth, they are just a small hill to climb in the process of mounting the highest aspect of your Divinity. The process is great but the rewards are even greater as each of us comes together in our full aspects aligned into One Being of Light. The cellular structure is being broken apart like a huge volcanoe. As this occurs, an individual needs to know what is needed and what needs to be forgotten. 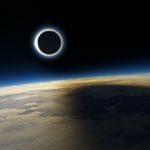 The Solar Eclipse of this month has created these elements to break apart into a new reality and sometimes an individual feels as if they are re-living some of the old aspects. This is no longer true. The parts that need to be removed will be done through accessing the highest parts of your divinity by allowing the lower parts to be removed. So in Meleriessee’s case, she is removing old aspects in many timelines in which she did not survive. It is part of the cellular structure and in order for her to move into the next phase of her existence, it must be done. It comes into play with the mental mind of surrender from these timelines. 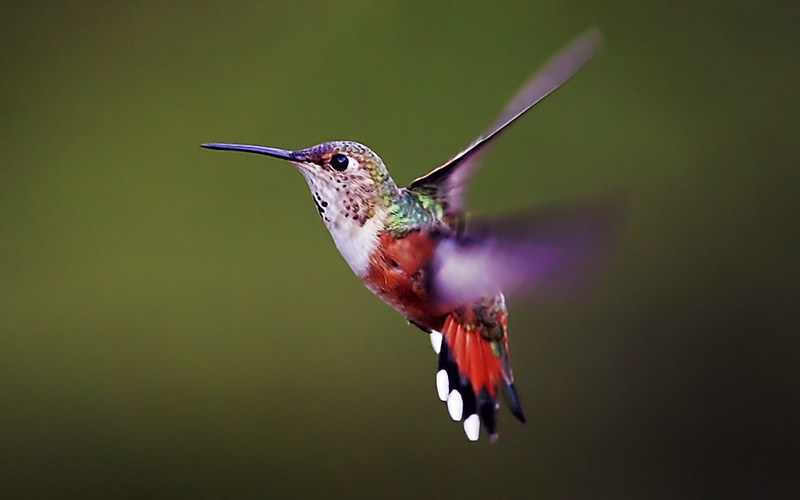 As she has worked with the higher energies, she has allowed the healing to occur. It does not mean that she is not physically feeling it because parts of those timelines need to be fully accepted by her newest divinity of light that she has integrated within her. We use Meleriessee as an example to help others to understand that it does not matter what level of consciousness you are incorporating, these elements will be happening to everyone on the planet. We all know that everything happens for a reason so take a look at what you are experiencing. Go beyond the feeling of the pain, whatever it may be, and accept the transition that is occurring. Every lightworker at this time that is intending to go further into the development of their Light Body is feeling at a loss and not sure what to do. The transition needs to happen in order for the New Reality to be fully accepted. Without the acceptance then we cannot step into the doorway without the old elements in place. That is when catastrophe can result within the structure of the individual. The energies are becoming increasingly more powerful and you as a Being of Light have asked to be one of the Light Workers to work with this light into the earth and others. You are the first wave of beings that are being challenged into deeper levels of your consciousness within your physical existence. If you are going into these depths, congratulations. You are among the first and will show others how it is being done. You are one step in front and allowing this frequency to be fully embodied within you. Those that are not feeling it as much need to go at a slower pace. We understand that this process is anything but easy. It is very difficult and can be so challenging. Each individual must feel it as they should and allow these frequencies to flow into a new existence of your reality. So this is the preparation stage. The 11:11 Doorway of Mastery will allow each individual to step into a higher level of their initiation phase. As we have explained, the process to get to this point will determine where you are going as an Initiate. Some may have just left the Hall of Ignorance, some may be just walking into their awareness, and then there are those that are further along. There will be increased light frequencies within each individual and upon the planet. This is one activation when the Love and Light vibration will be increased deeply so it is time to fully accept your Divinity in a new way of Existence. When we share what you will be experiencing, please know that this is a personal experience. What we want for everyone is to feel their essence in complete Oneness of their beginning, angelic self, galactic self, Mutli-dimensional self, and human self. It is all coming into this creation. That is why the challenges are great as all these elements are coming into play. It is a very powerful time to allow the totality of your Beingness to be fully accepted into your physical reality. So take time on this day to fully accept all these parts of yourself to come into your creation. Those of you that are being challenged will be feeling elements different throughout the course of the day. It is a time to fully accept all parts of yourself to come into your True Essence. You deserve it and it is time to do so. So when you connect see yourself going through the Gateway as the frequency is spinning around you, brining all parts of yourself together, as you feel your True Essence expanding within your physical body. See the Mental, Emotional, Etheric and the Physical Bodies all becoming One Body of Light as it was in the Beginning. We walk with you through these immense changes and deeply honor you for being on the planet at this time of Awakening for all of us. We are holding a ceremonial call Thursday, November 22nd. 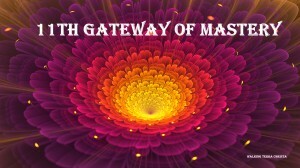 All are welcome to join us as we connect with the energies of the 11th Gateway of Mastery; November 22nd at 11:00 AM PST / 2:00 PM EST / 1900 hrs PM UTC, CONFERENCE PHONE: 530.881-1400, CODE: 148525#. Utilizing our 11:11 Activation Meditation will assist greatly in achieving optimal results for this energy. The Frequency Update is now available on video; Heliohah111 is the channel to check out the videos. Sign up as a subscriber and you will receive notification immediately when we load a new video. We are coming into a time when more individuals upon the planet are awakening into a consciousness that many of them do not understand. It is available to everyone on the planet to change the parts of themselves that they do not like or accept very readily by allowing a Spark of Light that is their highest consciousness to fully be manifest within their physical being. Humanity has been preparing for this time of awakening for generations ever since Jeshua walked this Earth imparting the knowledge of the Light of God to humanity. Of course, we were not ready to do it for ourselves. We needed to have someone to look up to as we did not believe it came from within us. He spoke in these words but duality was much too strong so the struggles continued for each of us. I believe that every person on the planet lived in those times. Many who are in the metaphysical realm of leading others truly have a strong connection to Jeshua along with many other masters. We walked the Earth with them in hopes that others would see the Light as we have done. So we came back time and time again to learn the lessons within the physical body to remember our Truest Essence. These timelines have not been without struggle, strife, poverty, and lack of true worth. We have learned time and time again that it is important for us to be our own Spark of Light. The Harmonic Convergence in 1987 was the beginning of all of this changing on Planet Earth. We were gifted with higher frequencies coming into GAIA as the Spiritual Hierarchy is now able to become more readily available in the earth’s atmosphere in order to prepare the Ones that would lead others into the same pathway. At that time, those of us that celebrated this moment had no clue what was happening except pure excitement and joy. The energies were amazing as people around the planet celebrated it in their own way. I was with two individuals who are no longer in my life in Cape May, New Jersey which turned out to be the high spot of Extra-Terrestrial activity on the Atlantic Coastline. We communed with the dolphins in a special way and felt the upsurge of happiness occur on the planet. There are many people that are no longer with us from that time, but they helped to mold the energies to be what we are going to experience on December 21st. After the New Millennium, we saw that we were literally walking into a New Age as the massive amount of people opened up their hearts and became the Light Workers of the world. It was at this time that I delved into the Science of Ascension and met Dr. Joshua David Stone in Mt. Shasta for his Wesak Festivals. I not only met him; I worked with his organization as a volunteer. It was a very exciting time. What made it even more powerful is the work that he brought forth to assist lightworkers to go into the depth of their soul and remember their true beginnings. I found this work a gift to me from God as I went deeper than I ever thought I could and found parts of myself that had been lost and other parts that needed to be removed. My first Wesak experience was tear-filled for three days not knowing what or why I was releasing; I just allowed it to happen. I believe that the Science of Ascension is the most powerful work upon the planet. I learned fully how to move through timelines of debris and find my true self. Our soul consciousness needs to be fully balanced along with the psychological self of the physical being that we are. As we receive more light energies within our physical, then we attune ourselves to our Divine Essence of the Soul or Higher Self and then our I AM Planet. There are more awakened people on the planet today than we ever thought would be possible. The changes with the planet and Gaia have continually shifted, but it is not nearly as bad as we thought it was going to be. Many individuals have chosen to leave the physical existence but many more are staying. People are now going to have the opportunity to bring more light within their bodies than ever thought possible. The choice is going to be up to every individual and whether to choose fear or love. But it goes deeper than that. The thought processes are just the first element to appear in one’s awareness. Then each individual must get deeper within themselves. Yes, the energies are shifting into a fifth dimensional focus but physically, we cannot accept it without the inner work that needs to be done. There will be a separation as time goes on as Gaia is allowing her ascension process to happen and so are we, as individuals of the human race. Ascension actually means –de-ascending the frequency within the physical creation with call the human body to feel our full Divine Essence as it was in the beginning. We are becoming multi-dimensional beings of light within our physical structure but that essence cannot stay with us until all the karma, debris, and elements of our old timelines are fully regenerated into the Light that We Are. So, it can be a challenge, but the rewards are so much greater. The body will eventually become the crystalline structure as the changes are made. We will heal in a moment’s notice; the physical reality will change immensely as the higher light vibrations fully come into the full arena of the creation that We Are. 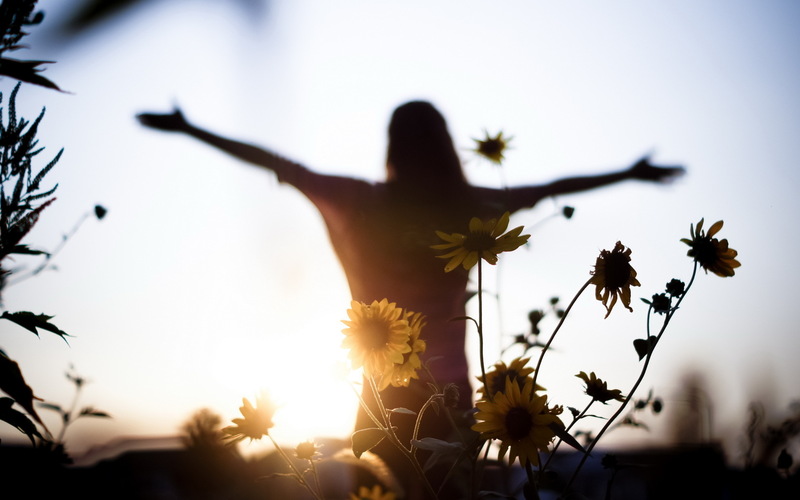 We are learning to be more positive and this also means to allow that to run through your Mental, Emotional, and Etheric bodies to create the new physical creation of Light That You Are. We have been preparing through this process since the year 2000 and especially this year of 2012, the Golden Era. We have been given opportunities for growth through the allowance of the higher vibrations to fully come into existence. Change is imminent and it will occur within each person. How they create that change is up to their own free will. December 21st marks the time of this new beginning upon the planet. It is in how we decide to fully experience it that will either make us better or worse. These energies that we are experiencing can be debilitating and create havoc within the physical structure, but the beauty of this is that it is not forever. If we learn to balance ourselves through the process, then we fully accept our Divinity in a new way of creation. Knowing that you will have bad moments along with the good is allowing the equilibrium of All That Is to be fully in our awareness through the growth process. At this time, we are all having the most wonderful opportunities being presented to us to go further and deeper into ourselves. This means feeling our emotions on a deeper level and allowing the thoughts to flow through us as we expand our energies. We need to acknowledge the everyone has “free will” and some souls may choose not to stay on the Earthplane. Others will choose to live in their duality and not accept the higher level of thought and creation within them. I think this is the hardest to deal with especially with our loved one who we truly want to see that they can have a better perspective within their world and around them. Surrender is the main process to the evolution of the Self. The most important aspect is taking care of ourselves. Once you do this for your own sense of balance and equilibrium, the healing gets to a much deeper level than you ever thought possible. That is when you find your soul family appearing in your life. They think and act like you do and you have an immediate connection to them. 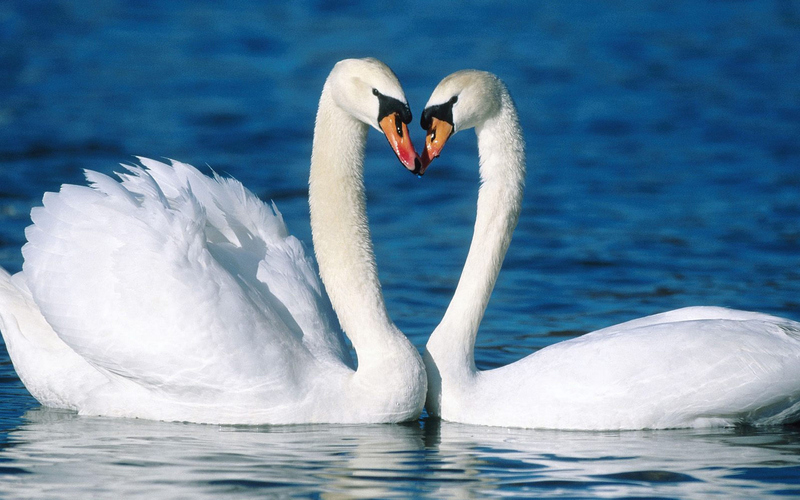 It creates a healing within your soul’s essence to be remembered by others and then you can move forward much easier and with the grace of a beautiful swan swimming on the lake. 12:21:12 will be this time when the Spark is fully ignited within the planet and each individual that chooses to accept it within their awareness. For those of you that are truly walking a pathway of master, we, Mel and Mike, from Walking Terra Christa are hosting a very powerful retreat in Mt. Shasta. You may attend for the entire seven days or a short session either in the beginning, December 12th, or the end culminating on December 21st. 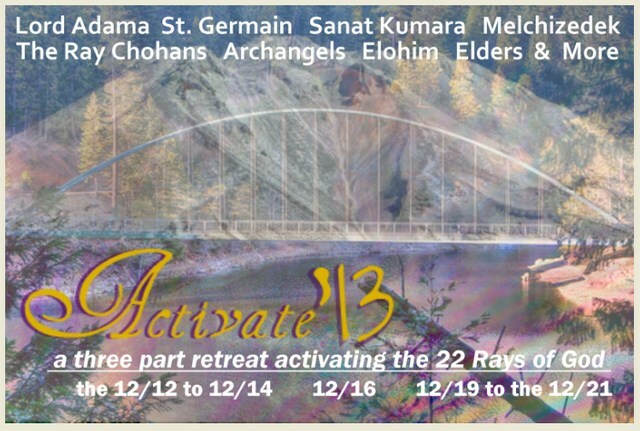 We start on December 12th for three days to prepare for the energies. We have one day in the middle as we Bridge the Energies from the Old to the New and then another three-day segment starting on the 19th through the 21st. We will be working with each of the Ray Chohans (leaders of the Rays) along with the overlighting Beings of the 22 Rays of God. We also have a special program with Lord Adama called the “Telosian Ambassador Program” which is working directly with the New Earth Cities, being trained for leadership within these cities, and working with Lord Adama and the Telosians. The one pre-requisite is that you attend one of our retreats and this is designated by Lord Adama himself. We will hold the 2nd part of the program during the retreat. We had a retreat in August where we all connected on a soul level and it was amazing. Continuing this experience is going to be wonderful for the December 21st activations. We call this event “ACTIVATE 13” as we move into 2013. Please check out the details on Walking Terra Christa and let us know if you feel a heart connection to be with us. To assist you through this process, we have been doing a special 10-week seminar with High Priest, Lord Adama, from Telos the City beneath Mt. Shasta, called “The Telosian Way of Being”. This is also available for download and we just uploaded the transcription on the first Introductory Class held on September 19th. People are truly feeling a difference with this course. Whatever you are doing for December 21st, please make it memorable and with people you truly desire to walk into the New Earth with hand-in-hand. It is a very exciting time to see so many people loving and sharing with each other so deeply. The Frequency Updates are brought to you to assist in balancing your four-body system with the energies that are occurring presently. Walking within the Mastership Pathway can be challenging and it is important to work through your Soul’s Psychological Balance. They are shared in a very easy and explicit way from the perspective of an Ascended Master and what he/she faces Walking Into the New Earth. We have just passed through the gateway of 11:11 which represents “AWAKENING” for every living being upon this planet. So this week is the beginning of an upsurge of energies to prepare us for the final entrance of the Christ Consciousness on December 21st. First of all, I would like to report that last week I shared that Mercury Retrograde lasted through December 14th; the information I was guided to share about this date is incorrect. It means that energy can be with us within a lesser degree until that date but it actually stops its backward cycle and turns direct on November 26th. On November 13, 2012 we experience the New Moon energies with a Solar Eclipse at 22:09 GMT/UC. This New Moon being in Scorpio represents working on our self-mastery skills along with learning how to be passionate, resourceful, focused, probing, deep, and perceptive in our personal lives. This is going to take us to a deeper level once again to acknowledge the parts of ourselves that have been put into the background and allow these elements to shine through the window of our soul as it also allows for the elements we have not wanted to deal with to fully arise out of our reality as it truly does not serve the newer essence of Light that each of us is becoming. In other words, this week can really have a balancing effect on us if we allow the truth and wisdom to shine together in one essence. Just as the planets are being very active presently, the solar flares can change quickly. At present, it seems as if we are not being affected by the Solar Flares but expect energetic changes with the Solar Eclipse on the 13th of November. It is our pleasure to converse with each of you in this way especially at such a very important time of existence upon GAIA. We come to you in the consciousness of the Unified Whole Command with Master Thoth, The Great Divine Director, along with Albert Einstein who is helping to bring forth the existence of these energies within the Earth Plane. We have a very exciting week that is upon us; when we say “we” it is in the collective consciousness in respect to the presence of the ALL. As we are bringing forth the message, there is so much more activity that goes on behind the scenes ‘so to speak’. Since the doorway of the 11:11 was activated on November 11th, the increased energy frequency upon the planet is being accepted by more individuals than we had previously hoped. We know that many souls are awakening but sometimes the word “awakening” can have some inner meanings that are not received in a generalized way. We want to thank each of you that participated in any way on allowing these energies to be fully within their Being on the 11th as you truly assisted in allowing the Ones that have no idea what is happening to fully see within them on a deeper level than before. So let us get on with the message at hand. This first doorway in November is an active participation of each individual soul to feel these energies first-hand. Now there are still going to be more that do not understand what is occurring, but it is important for each of you to accept the light frequency within you and expand it around you. It is not yours to hold onto in anyway, but you are the conduits of the frequency just as we are sending the message to you in this moment. It is a chain reaction that is occurring which requires great insight into yourself. This is exactly what occurs within this Gateway as the preparations are going into a deeper level than they were previously and we are happy to be of great assistance. You have not had much time to reflect on these changes that are happening within your cellular and physical construction. We want you to realize that preparations have been made through your Higher Self to receive the highest and most balanced optimum frequency that will not overload your system. So, at times this week, it may seem as if the frequencies are at a very intense rate; that is, when you communicate with your Higher Self to fully accept the level that is appropriate for your body. Now your Higher Self has been trained to extend the frequencies to you in a most appropriate manner and as any new student must understand, they may not want to receive the highest performance. It is like being an athlete and you are training for a big event. Some days you just don’t want to do the work because it seems too intense and your body may not be able to handle it. But then when you start slowly, then you realize that your body is fully accepting the challenge of your training. Each of you is in training as this is exactly what you are experiencing. Some days will be better than others. On November 13th the Solar Eclipse occurs within the New Moon cycle which will represent the balance that is necessary. You will find that these energies can assist you on a much deeper level as the emotions that you feel will be surfacing out of your emotional body. Be kind to yourself when this occurs as it can be quite intense. But what will happen through the process is that you will feel the compassion and focus that is necessary within your life. The Feminine and Masculine Divine energies are coming together to allow the co-existence of both of these elements within your four-body system. You must remember that you are going into depths that you never experienced before and within those levels are parts of yourself, old timelines, which have been lodged deeply within. This Solar Eclipse is going to go within a deeper level of your shadow side in order to allow the lighter parts of your essence to shine. Together, they are just enclosed within each other as an individual cannot predict how the energy is going to effect themselves either positively or adversely. This event is going to help change those parts within yourself on a much deeper level. The result will be the truth of your existence blending with the wisdom to allow it to fully create your intended focus engineered by your Higher Self and I AM Presence. So you may ask, “How do I assist myself through this process?” Learning to how to balance each of the masculine aspects along with the feminine will be the key to your evolution of the Self. Sometimes an individual truly does not understand how to go about assisting themselves if there is no knowledge of where to start. Take a look back within this 24 hour process and allow the timelines and events to enfold within you. Were you having any reactions to anything that you were doing, seeing, observing and then acting upon it? Sometimes we do not see the forest for the trees. This week will give you the knowledge, expertise, and diligence to go on a much deeper level than you ever experienced before. It will not be something that you have to search for; it will appear to you in a dream, a thought, a feeling, or within your meditation. Notice how you previously have reacted to others. Then see the difference of your actions. This is the WEEK FOR THAT CHANGE. The planets are aligning in such a way to assist with this process. It is important to go deep within yourself especially if you are unsure of what you are supposed to be working with. These are the ones that are fully being egotistical about their own pathway. The lower mind blocks the higher mind from being accessed so work with it as best as you can. Ask this week for the energies to show you these facets that are deep seated within your existence. You will thank yourself for it immensely. After the Solar Eclipse, this energy will continue but being within New Moon cycle will allow you to continue within the balancing act. It will assist you in remembering to walk a straight line and not go to one side or the other. This will throw you completely off of what you need to do. Once you do slip, get back up, and do it again. It will become easier to fully acquire this essence within you. It is our pleasure to be with you during this amazing time of change. ©2012 Walking Terra Christa, Rev. 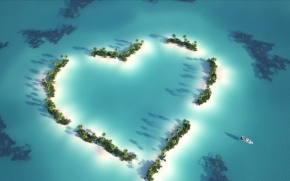 Christine Meleriessee & Mike Hayden, Vibrational Ascension Mastery ~ All Rights Reserved. No use without prior written permission allowed except for sharing the link to this page, http://walkingterrachrista.com. I have been guided to write this post for those that do not understand what it means to be an AWAKENED BEING OF LIGHT. As a student of ascension for many years and now a teacher in this realm, I have a tendency to direct my posts toward individuals that are already on the Pathway of Light or Mastership. But what about those that may not understand what December 21st, 2012 may mean for the general public? So I will try and write in layman’s terms of the mere beginning of what it means to know my Inner Truth and to share it as best as I can. I have had friends in the past that did not understand me. So, of course, they are no longer in my circle of acquaintances. This is what happens when you walk into a journey that many do not understand. I also have family members that truly do not understand the depth of my knowledge or why I am doing what I love. They just accept it after 25 years of me being on this pathway. So I dedicate this blog to those of you who want to know more but are unsure of where to look. First, I want to make it clear that I am not a teacher of the uninformed. Most of our students at Walking Terra Christa are Lightworkers and have been so for several years. They want to delve deeper into their Soul’s essence to heal themselves on deeper levels. Some of you may already been in the Self-Help pathway but what I am about to share is way beyond the origin of feeling good about yourself. What is a Lightworker? Hmm…I think it speaks for itself, an individual who works with the light which can mean a variety of elements: earth changes, healers, coaches, etc. What I do is teaching about the Pathway of Mastery and each of us being those masters for the New Earth. Which really brings me to the subject of this blog, The New Earth. What does that mean? Will this Earth desecrate and no longer exist? Not sure about that element but what I do know that the world is changing but not everyone within this world. We have been in the stages of duality for a very long time and we are now moving out of that role as Gaia, who is the name for Mother Earth, is evolving just as we are individually. The term is Ascension but in reality it is about –DE-ASCENSION. We are now accepting the fact that we are more than our physical bodies. We are learning that our Higher Self who is our Highest Consciousness is de-scending into the physical reality and not just on a consciousness level but PHYSICALLY. What does this mean for us? Well, the physical body is not used to a higher Light Quotient. What is a Light Quotient? Well, it is when we accept the higher dimensions within our physical body beyond the 3rd. As more light enters, it causes the body to react by not sleeping, sleeping too much, eating differently, feeling differently, periods of happiness or sadness for no reason, and the list goes on. Everyone feels it differently so there is no rule in how to treat it except being kind to ourselves. It also represents that we be lieve in Oneness – that each of us are part of a Creative Process in which we were ONE Spirit all together. The Creative Source of Oneness decided that this should change so Divine Mother and Father God were created along with each of us as our I AM Presence. Then we were separated into embryos known as Souls. We have 144 souls within our close soul family divided into 12 pods in which on a higher consciousness, we interact with each other. So what is occurring on the planet now is that people are activating these parts of themselves into the physical creation. It takes a lot of work though to fully activate these energies, because we have blockages from previous lifetimes called Timeliness that are now being dissolved. This is what happens when an individual becomes aware that there is more to themselves than just the physical creation. We also learn that we create our own reality. That is a tough one to figure out also. 2012 is being considered the Golden Year which means more individuals have awakened with these concepts than any other year of the planet. It also means that people that hated themselves learn that they can love themselves just as much and it takes a whole lot less energy. Healing occurs in many different levels through the Physical, Emotional, and Mental bodies. But it has to go through each of those bodies for it to happen. Now at the same time, Gaia, Mother Earth, is also ascending. So the geographic areas are changing with the healing she needs to do. This also brings us to the next part of our journey. Every individual has a choice whether to feel fear or joy and it creates Gaia to overact in certain ways. Every time there has been a prediction of geographic catastrophe there are many Lightworkers on the planet that are assisting energetically to heal these areas which makes a big difference on the healing of the Earth. Now that I have laid most of the groundwork, it should help to understand what is happening presently. I could write for a long time on each of these elements but that is not my goal. My focus is to assist those that do not understand what the Mayan Calendar is showing us in a change in consciousness on December 21st, 2012. That’s exactly what is happening. More light is coming into the planet than ever before and is calling an accelerated amount of frequency to be embodied by every living element on Earth. Each of us is changing greatly even if we don’t want it to happen. There have been predictions that it is Doom’s Day and the world is ending. I do not believe that fact, but we are changing and must change with it. Let’s face it, more and more people are choosing to leave the planet. This is because the energy is getting so intense that we need to move with it or it will create more havoc in our lives. We have been in a period of duality for so long that many think that is how it needs to be. Well, my friends, it is going to change at the end of this year. We are coming into Oneness but every living being has to accept it for themselves. We must not blame others for our problems and see that we are all part of the issue that is occurring. There is light and dark upon the planet but in order to see the light we must acknowledge the dark especially within ourselves. This is truly the awakening we are going through presently. Elements are arising for each individual to change it and if it is not changed, it will get worse, believe me. So if you want to take a look at what is happening within the planet presently, here are some earmarks of events. The New Moon and Full Moon are very powerful times and we need to take advantage of them. In the Month of November there are Eclipses with each of the moon cycles, there is an 11:11 day and then a 11:22 day. These are activations from a higher consciousness that allows doorways to be opened into a new reality. When you allow yourself to be willing to see beyond the physical, you will see the beauty of who you are. Each of these dates are helping us to move into two more amazing dates of December 12th and then the 21st. The planet is being infused with the highest quality of light ever possible upon this planet. The Christ Consciousness is now our awareness. It does not represent Jesus but what he stood for and all of the Ascended Masters of the Spiritual Hierarchy. We are not alone. Many follow the angels in their religious teachings. What I am talking about is all those religions came from one source and learning to approach it within Unity of Spirit. We are now going back to that Source of Light that We Are. So how do you help yourself with this process? Being better with yourself, accepting your faults as not faults but change them into beautiful moments. Acknowledge you have anger and releasing it by realizing the fact that you are a Divine Being of Light and allow those thoughts to be within you completely. Everyone needs to wake up and realize that we are Divinely Guided and not as looking at GOD but having GOD within us. We are children of God and we are here to do very important things. We have gifts to share and also to receive from others. These elements also come into our physical body through the Etheric Body. It remembers everything that you have ever experienced and creates dis-ease within the physical structure. It is important to clear all of the issues in order to raise our consciousness and physical existence within the Earth. Eventually, we are all moving into a fifth dimensional existence. Some believe it is happening now but on a physical and geographic area, I believe it will take some time. But this year in 2012 is our first step. What we do not take care, WILL BE TAKEN CARE OF FOR US. So it is imperative to get moving into our Inner Self and Heal more deeply than you ever thought you could do so. It will change how we view life and our relationships. Elements can change deeply through this process like friends leaving you or others not understanding, but it must be looked at as this is the process of loving yourself. Change is good; when we stagnate we become lodged within our own fears and judgments. This is a huge process but if you feel it is time to look at yourself with a better perspective, than please do. More and more people are waking up unto themselves, and this is the beauty of this age of enlightenment. Take time in the next six weeks and reflect on who you are. The parts of yourself that you do not like, then work on changing them. Breathe deeply and allow your essence to enfold within you. Be positive with your thoughts and your words as it reverberates across the Universe and comes back to you ten-fold. So if you are flowing and loving, eventually you will feel it within yourself. If you want to go to deeper levels, find a meditation group to help you connect to other parts of yourself. You just may find one of the members of your soul family that wants to meet you. If you want to delve more, then read about the teachings of the Ascended Masters or look into channeling from some very beautiful beings of Light. The reflection is so deep that you will find yourself in some of these expressions that are awaiting for your arrival. If you want to go further and step into the deep aspects of Ascension, contact us at Walking Terra Christa. We hold weekly calls and free open calls for the Full Moon. Check out our website as we have a great deal of information that can assist you to delve deeper into your Soul’s Essence. It is a great time of Awakening and now is the time to do it.